Last night the group had overnight home stays where we spent a night in groups of 2-4 with willing members of the Zambezi community. We (Hannah and Kylie) were lucky enough to be picked up by Daniel, an accountant of Zambezi, his wife Namakow, his three daughters ages 2 months to 6 years, and his two teenage cousins. Our fellow Zags, Matt and Chris, also joined us to stay with this very generous family. As the four of us followed Daniel home, we noticed that there was a gathering at one of the neighbor’s houses. Without a word, Daniel led us into the party and sat us down front and center. As it turns out we ended up in the middle of a Zambezi bridal party from a wedding that had happened earlier that morning. Since the bride and groom were from different tribes, this gathering was a celebration as well as a meeting to reconcile any divisions between the newly formed family. We were warmly welcomed with dancing, singing, as well as a beef snack consisting mostly of burnt cartilage and bone. Hannah, being the trooper of the group, started gnawing on her tough snack while eyeing Kylie with high concern. 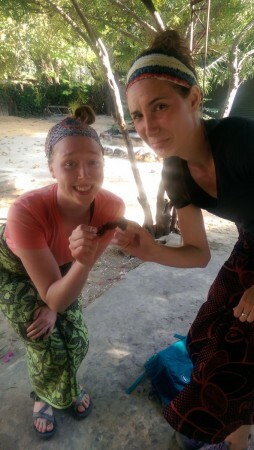 Kylie casually leaned over and told Hannah, “the Zambian men are staring and pointing, choke that meat stick down!” The Zambians noticed Hannah’s struggles and quickly brought her a new piece of meat, leaving her with two tasty treats. After we finished dancing, we followed Daniel out of the party and to his home. Little did the group know, Hannah found herself in quite a predicament with the hardened meat still in her hand on our way out of the gathering. Not wanting to be rude, Hannah got the great idea to put the half eaten meat stick into her backpack…. Needless to say, there will be more to come on this brilliant decision later. At Daniel’s house we all sat in his living room watching Zambian TV and news, feeling awkward but warmly welcomed. Daniel’s cousin Owen tried to teach us local Lunda and Luvale greetings, but our American brains struggled to remember them, along with our hosts’ names (Mapollo, Salome, Namakou, Enni). We found tricks to remember their names more easily, including reminders to trigger them such as Apollo 13, Salami meat, mama cow, and “any”body… As embarrassing as these tricks were, we found they were our last hope in light of our extreme exhaustion and continually expanding vocabularies. Due to Daniel’s shyness, we were relieved when dinner was announced. The women, who had slaved over the meal, left the house to give Daniel and us space to eat at their table, again reflecting the generosity of the Zambian people. Hannah, once again the trooper of the group, lifted up the covering off the first dish, to find fish heads staring back at her. Not skipping a beat, Hannah looked up from the bowl of large decapitated fish and said, expressionless, “fish anyone?” After pouring warm water over our hands into a basin he held for us like royalty, Daniel taught us to eat Nshima (a maize staple in Zambia), Chinese cabbage, and the fish heads with our hands. Kylie cautiously asked Daniel with as much politeness as she could muster how to properly eat the fish like a true Zambian would. Daniel blankly replied, “We eat all of it”. So the group toughened up and ate scales, occasional ribs, and whatever else was thrown our way. Our American ignorance once again came into play as Daniel passed us peach juice for dessert to serve ourselves. He told us to dilute the juice with water: understatement of the year. Our 1:1 dilutions left us drinking flavored fruit syrup that burned of sweetness on the way down. After we choked down the first gulp, Daniel’s 6-year-old daughter Mapollo said quietly, while shaking her head, “you took too much juice”. Yes Mapollo. Yes we did. Mapollo-1: Ignorant us-0. After dinner we joined Daniel and his cousin Owen in the living room for a group bible study. We read passages and shared what was in our hearts about God. It was our favorite part of our time in Zambezi yet. For the first time, we truly felt a deep meaningful connection with these strong, loving, resilient people. We realized how universal God’s love is and how not even 10,000 miles can change that. What a beautiful experience. With full hearts, stomachs, and bladders, we headed to bed. The family of seven graciously offered up two of their three bedrooms for us. We reflected on how rare this kind of unrestricted generosity and selflessness really is. This description for the overnight stay would be incomplete without mentioning the return of the meat stick. As Hannah pulled out a blanket from her backpack, bugs scattered across the mattress. Kylie horrifically jumped back and exclaimed, “HANNAH, WHERE ARE THOSE COMING FROM?!! !” Without saying a word, Hannah reached into her bag and pulled out the meat stick, saying, “I sort of forgot that I put this meat thingy in my bag after the party”. Kylie was less than pleased as she restrained herself from screaming, “HANNAH WHAT IS THAT THING AND WHY IS THAT CARCASS IN YOUR BACKPACK?!”. Exchanging confused and exhausted looks, they both keeled over in laughter, nearly emptying their full bladders after the juice event. For at least an hour, Hannah and Kylie brainstormed how to get rid of the meat stick discretely. Considering that the family was eating dinner in the dining room outside of the bedroom, the options were slim and the ideas became quite creative. After much deliberation, we came up with ideas ranging from disguising the meat as a little poop, hiding it in our chitenges as we casually walk towards the front door, throwing it out the barred windows, and even disguising it in a granola bar wrapper to get past the family, we were stumped. Trash bins were hard to come by and the family continually insisted on waiting on us hand and foot. They would surely ask what we needed the second we exited the room. The winning idea was simple yet flawless: put it back in the backpack, draw the drawstring tight, and place it in the far corner of the room (by far, we mean 3 feet away at most). As we got ready to turn out the lights, Hannah realized the juice was not going to wait until morning; she would have to use the bathroom. As she approached the bathroom, she heard a stifled, defeated voice say “whhhaaaaatttt???? ?” and tinkering noises coming from the other side of the door. Recognizing Matt’s voice, Hannah opened the door, revealing a much-relieved Matt who had spent the previous several minutes trying to get out of the bathroom door which lacked a functioning handle form within. Ignorance seemed to be the theme of the night, because Hannah happily hopped into the bathroom behind Matt, closing the door behind her. Rookie mistake. Luckily the family came to her rescue, once again reinforcing that our American brains couldn’t quite wrap themselves around Zambia. When Hannah returned form the bathroom, she found Kylie huddled in the fetal position in the corner of the bed, with a look of sheer horror on her face. Come to find out, the closing of the bathroom door behind her prompted two rabbit sized rats to scurry form their hiding place in the ceiling above the bedroom and crawl down the wall within a foot of Kylie’s stone frozen body. The bugs from earlier now seemed like a pleasant alternative to our new furry friends. Yes, friends. They would soon come out to play fro the remainder of the longest and funniest night of our lives. The damn meat stick once again became an imminent concern, now that it was attracting rather large rodents. After giggling and brainstorming for another hour, the decision was of course a simple one. Use the malaria mosquito net to literally wrap our bodies like two sausages in a confined breakfast burrito. Hannah and Kylie got close on a whole new level. Thankful to have Matt’s headlamp, we were finally ready to turn out the lights. We snuggled into bed, but the comfort quickly disappeared, as we heard squeaking and scurrying form the above and below. Apparently Kylie was more traumatized than Hannah, because Hannah was snoring within 10 minutes. Hannah periodically awoke to check on Kylie who, yes, was STILL AWAKE. At around midnight, we began to hear munching from below. The sounds of small teeth of slick REI fabric suggested that the rats had found the treat. The catch phrase of the night quickly became “it’s fine…. it’s fine” as we tried to reassure ourselves. Scared to even look at the damage that was being done, we waited until the despised roosters started to crow and the light began to seep in through the window. While straddling the couch and bed, Kylie finally gained the courage to check the backpack lying below. She threw sandals at it and used the strap to strategically check for any signs of rats. Needless to say, we owe REI one hell of a customer review; the backpack showed no signs of damage. Despite hearing claws sliding on slickery fabric, the infamous meat stick lay untouched inside. We spent the remaining time until morning in our twin bed exploring the few contents of our backpacks to prepare ourselves for church with Daniel and his family: hand sanitizer, a hair tie (which snapped in half soon after), two pieces of gum, which made up for our terrible breath in lieu of a toothbrush, and travel Kleenex to blot up the grease coating our hair and bodies. Luckily, we recovered from a night of ignorance by finally coming up with a logical plan- we put the now terribly smelly stick back into the backpack and headed off to church. Oh my darling Hannah! I could imagine so clearly your optimism and ingenuity to get through this night! But, meat stick, in the backpack? Hahaha. You are the absolute best. I had such an amazing experience with my own home stay last year (Steven and Violet anyone?) and was so amazed by the love and hospitality of the people of Zambia. It was so good to hear about it and again, and this kept me laughing the entire time I was reading it. The refrain of “its fine, its fine” is so completely wonderful and accurate. You were all troopers and have great stories to show for it. This is one of the best things about Zambia. There will be more meat sticks, more fish eye balls, and more rats, more versions of the adventure of not really knowing what you are supposed to do or say. And sometimes, you will need to eat all of it, and sometimes you will need to just tie up your backpack and wait it out. You guys can do it, and will have the best story to tell the next morning. PAXTON: Lovely post yesterday! I loved seeing the first couple of days through your eyes, and am so excited to hear and see this place become home to you, through your words and stories. You guys are starting your projects tomorrow, right? Good luck to all of you and have so much fun! And teachers (go, Lili, go!) enjoy your walk :). I can just see Kylie so politely asking how she should go about eating the fish head, and brainstorming how to hide the meat stick in the granola wrapper and many more ideas. I couldn’t help but laugh and get a perfect vision of her when the bugs popped out and the rats making an appearance. Poor girl! Sounds like a blast and I’m sure they are all enjoying it! Tell Kylie I love her and I miss her please!! I could not stop laughing reading this post. So many “Are you kidding me? !” moments; but like Lucy said, it’s just one of MANY crazy adventures you’ll experience in Zambia. It’s truly an emotional roller coaster and I love that you’re both fully strapped in and enjoying the ride. I am so happy your home-stay was one for the books and I have no doubt it will be a memory you cherish forever. Personally, I plan on re-reading your reflection a few times over just to indulge in some comical entertainment 😉 Keep embracing every twist and turn on this wild, sometimes uncomfortable, but extraordinary roller coaster ride. PS- If any of you were blessed to stay with Mama Catherine, lets get together when you’re home and rave about how incredible she is. Oh.my.goodness. What an experience! Way to keep your sense of humor, ladies! Through your words, you can tell you both model servant leadership and are most gracious. It must be very difficult not to compare our way of life to the conditions you’ve been exposed to in Zambezi. I recall Conner stating over and over after his last trip to Africa- the biggest lesson learned was how the Zambians lived in the moment, they don’t dwell in the past or worry too much about the future. Love you, Conner House! Great story! I lauhged so hard when I read this post. I can only imagine you guys telling the group the story and everyone just rolling around with laughter. I know this was an uncomfortable experience for the two of you. Trying to sleep in a place that is out of your norm throws you off a lot, but remember these are the stories you will treasure forever. You are hear to tell them and survived a night in the bush. I have several stories for my travels where I was extremely uncomfortable. Now I just laugh about them and can apprecaite what I have that much more. Thinking of you all. I hope you got my post from the other day. Wait. Stop. This is so funny! Han, seriously? The meat stick in your backpack? Lol lol! You two had me laughing so hard! Something you wont forget that’s for sure! I can’t wait to hear about all of your homestays! Josh, Conner, Jeff (can I call you Jeff?) I want to hear what you guys did too! Sending my love and prayers! Kylie! These were the moments I was so excited for you to experience and I’m so happy Zambia isn’t cutting you any slack. This night is just the first of many challenging things you’ll experience during your time in Zambezi. But remember, these moments become the stories you tell the rest of your life; soak it all in. Sending my love to all! What great stories to help us understand the experiences and feelings that you all are having in Zambezi. I can hear and feel Hannah’s uneasiness and laughter as she problem solves in a foreign land. I am overwhelmed by fact that with all the cultural, language, and societal differences, you have a strong sense of the unity of God’s people and that love is universal. God is so good! Please give Hannah a hug from her Vancouvi family! We love her so! Keep the posts coming!! Hello and good morning! My name is Tamryn. For those of you who don’t know me I traveled to Zambia last with last year’s group and will be a senior next year at GU. I have been getting up to speed with your adventure today and loved re-living my own experience through hearing yours. I look forward to following your adventure over the next few weeks. We are lucky to have the blog to bridge two worlds. Kylie and Hannah, I laughed out loud reading your post. Sounds like a night you won’t forget! I appreciated hearing that you encouraged each other throughout the particularly “out of your comfort zone moments”. I definitely grew braver throughout my time in Zambia, with the help of my fellow ZamFam members. Know that giving small reassurances can help your friends as you all try new things and cross those invisible lines. Looking back, I have realized that being in Zambia was probably the second most stressful time of my life– second to when I was a baby. In Zambia, you are taking in so much new information each day and trying to make sense of it all. If I could give you one piece of advice from someone who has been there I would say to give yourself breaks and practice self-care. This includes turning off the judgments of what you “should” be doing in Zambia and alternatively listening to your own inner voice. You know what to do. Be still, listen and hold onto each other. You will discover incredible things. Okay… now I can relate to Katie. I sat down to write a short reply and now have taken up several paragraphs… oops. I hope it has been helpful and again I am truly blessed to get to follow your journey. Savannah, Charlie, Shannon, Christine, Josh, Susan, Connor and all of the other Zamily members– you are in my thoughts. Wishing everyone many smiles, hand holding and mwane! p.s. Savannah- Monica Clark said to say hello and that she is thinking of you. Have a great day! It sounds as if your Zambia experience has been incredible, if not more than a little unsettling at times. Kylie, you are spot on with the ignorance we have because of the culture we have grown up in. I wouldn’t have known just how different, yet alike, two peoples are. Thanks for sharing. Aaaand shout out to you and Hannah, Chris, and Matt! Way to press on and conquer those fish heads, bathroom locks, and bugs rats and all sorts of critters!!! That takes a lot of strength mental, emotional, all of it. That was quite a story. Hannah, I can easily picture you opening that pot, then looking up and smiling while announcing “Fish anyone?” You handled that amazingly. Paxton, I bet that sunset was absolutely stunning. I am trying to picture it. I come up with little pieces, but know I would have to be there to complete the whole view. This is such an INCREDIBLE experience, I look forward to hearing more of your stories! I too read this post several times and couldn’t stop laughing! Could this actually be coming from my vegetarian, neat as a pin, bug despising and oh so orderly child? I knew that this experience would be enlightening and life changing but it never occurred to me in just how many ways. I can just hear you two girls giggling! We love and miss you Kylie Edinger! Keep following your heart and chasing your dreams! Wow! Homestays at Daniels seem to produce very funny stories. I too got locked in the bathroom, and, well, let’s just say the toilet wasn’t working properly as well. Kylie and Hannah, even though I don’t know you I thank both of you for bringing me back to that night in Daniels home, sharing a meal of fish, the word of God, and yes many awkward and funny moments remembering names and starting conversations. Reading how you both took uncomfortable moments and decided to laugh at it tells me you all are doing your best to stay in the moment and not let anything hinder the experience. Continue to laugh and share these stories with each other. They will become running jokes to lighten up a sometimes intense reflection. Lots of love. Keeping you all in my thoughts and prayers! this is AWESOME! The homestay is no doubt one of the best ways to really get an idea of what it means to live as a Zambian and also get some great stories. Continue to open yourself up to any and all encounters you may have in the coming weeks as these will provide friendships for years to come. Kylie- it seems like it was yesterday when I was telling you about this trip and you said “i dont do spiders, or dead fish, or rats”…. looks like you got the trifecta and lived to tell the tale! As you go into your Health Education lesson plans, keep this same sense of adventure, spontaneity and fun each day and everything else will fall into place. Scratch this and Victoria Falls off the bucket list, drink a mosi, and eat as much casava as your stomach can hold… soon enough you will know if you do not already! Wow what an eventful day that was for you both! Sounds like a real christening to an amazing month ahead and I am very excited for you all on this trip. During the 2012 trip I lived vicariously through Jonathan Droessler and Aubrey Weber, two very dear friends of the Zambezi community, and I am so happy to be following this again. Kylie, you are courageous, crafty, comedic, and I can definitely picture your reactions in those life-threatening and life-enhancing moments! Wishing for you continued strength throughout the weeks while building amazing friendships. Cherish every interaction, soak it all in, and may the meat stick be ever in your favor from now on! Hahaha I was laughing out loud while reading this. Kylie, I’m sorry that was such a rough night! I hope Han’s puppy-like energy and bubbling laughter gets you through tough situations like fending off huge rats! I love reading this story! Thanks! Bugs. Decapitated fish heads. Infected appendages. Malfunctioning door handles. Rodents holding you hostage in your own bed. Decomposing chicken cartilage. The inevitable gastro-intestinal issues that you can only pray occur in the vicinity of a flushing toilet. These day-to-day struggles are not insignificant – they are etchings of a new brand of resilience and adaptability that you may have never required before. Some days will be about curling up in the fetal position and wondering how you are going to make it through the trip, other days will be about attacking those challenges head-on (eg. with Raid, a strong stick, a heavy dosage of Cipro, etc). I was a little late in catching up with the blogs–due to moving. Hilarious–kept me giggling for a very long time! I see a delicious meal of shish kabobs in your futures!